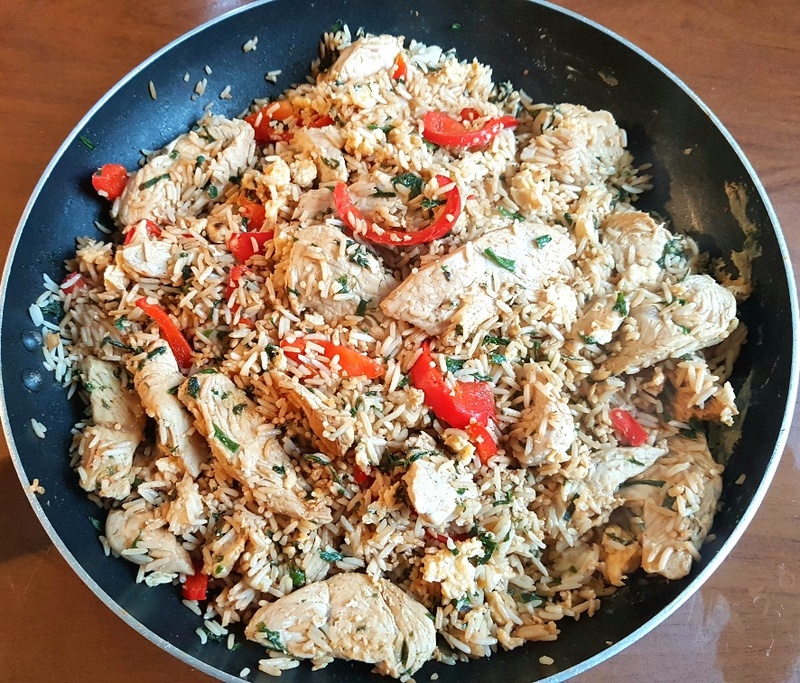 Today I’m going to share my recipe for Turkey Egg-Fried Rice with you, but first I’d like to share some exciting news! I’ve published my first cookbook! 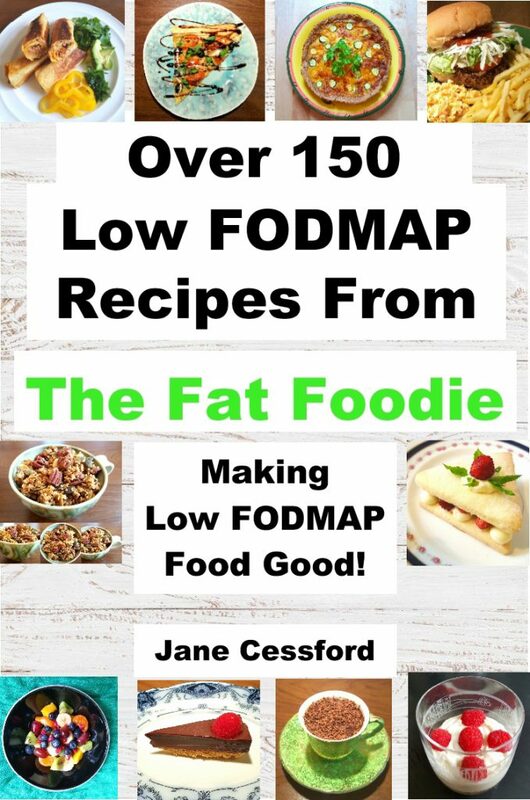 It’s called Low FODMAP Recipes From The Fat Foodie and it contains over 150 of my low FODMAP recipes, a great many of which have never been published before. Low FODMAP Recipes From The Fat Foodie is currently for sale on Amazon Kindle here worldwide and print copies will be available to order from them soon too. You can also just click on the front cover image below and it’ll take you straight to the product page. I just want to take this opportunity to thank everyone who uses this site. Your visits to the website and interest in my recipes have made this happen, so thank you very much! This Turkey Egg-Fried Rice recipe is kind of an off-shoot from my Sesame Pork Loin recipe (which can be found in my cookbook Low FODMAP Recipes From The Fat Foodie) because I learned how to make egg-fried rice to accompany the pork loin. Since mastering egg-fried rice (and it’s absurdly simple to make) I’ve made it countless times, but I thought that this tasty variation deserved a place on the blog. Turkey is a really healthy meat because it is a great source of protein and it’s very low in fat. I enjoy cooking with turkey because it is a bit less strong tasting than chicken and as a result it absorbs the flavours of herbs and spices really well. Turkey meat is also a bit firmer than chicken, so it provides a nice texture contrast to the soft fried rice and tender scrambled egg. I think we can agree that we all enjoy a takeaway once in a while, so I think you’ll be pleased to hear that this is an excellent cheap home-cooked option if you want to save yourself some money and skip the takeaway one night. The first time I made this for my step-sons and served it with my homemade low FODMAP Katsu Curry Sauce they honestly thought that I’d ordered it in from a Chinese restaurant. It’s that good! So, if you make this I don’t think you’ll be disappointed. Mix the sesame oil into the eggs and beat and then leave to one side. Heat the vegetable oil in a large frying pan or wok and once it’s hot add the turkey. Once the turkey is almost cooked add the sliced red pepper, chives and ground white pepper. Cook for 3-4 mins before adding the pre-cooked rice and soy sauce and stirring through. Move the contents of the pan over to one side and pour the egg mixture into the free area. Let the egg cook until just before it’s fully set and then break it apart and mix the egg into the rice mixture. Once the egg has fully cooked serve the dish. You can now buy my cookbook! can I buy a fodmap recipe book? You certainly can! I’ve released my first e-book and it’s available worldwide on Amazon Kindle (although you don’t need to own a Kindle to purchase it because you can download the Kindle app for any platform now) and it’s also available in a paperback format too. Here’s the link for Amazon.co.uk, but if you’re in any other country you can buy it from the relevant Amazon to your country of residence. Thanks!